Proterra and LG Chem step up their battery game. If you think Tesla’s 300-plus-mile battery range for its electric cars is a big deal, here’s a new world record that triples that figure. On Tuesday, electric-bus startup Proterra announced a world record by test-driving an electric bus for a whopping 1,100 miles on a single charge. The previous world record for electric-vehicle range was 632 miles for an electric bus and 1,013 for an electric car. The milestone shows how battery-powered autos are quickly developing into a competitive form of transportation, even compared to gasoline vehicles. Researchers at Bloomberg New Energy Finance predict that electric cars will be cheaper to buy than gasoline cars in the U.S. and Europe by 2025. The analyst team at Wood Mackenzie predicts sales will hit 100 million by 2035. That number could be conservative, given how quickly vehicles are improving. With technologies like Proterra’s, electric vehicles are starting to move into markets beyond passenger cars, like buses, shipping vans and trucks. Tesla plans to unveil an electric semi truck next month. Proterra’s Chief Commercial Officer Matt Horton described the company’s new record as “a demonstration to the transportation industry that electric vehicles have arrived and are a mainstream, real-world solution.” Proterra, founded in 2004, makes and sells electric buses to cities like Seattle, New York and Dallas. Most of the company’s electric buses won’t likely have such an extreme range, though its customers can customize the buses and add on range if it’s needed. The company says its newest-generation battery will deliver a bus range with 350 miles. Many of the most popular electric cars available have a range of around 200 miles. Proterra, which has delivered over 100 electric buses to customers, used lithium-ion batteries supplied by LG Chem for the test, and has also partnered with LG Chem on its latest commercial batteries. The company previously worked with battery maker Toshiba on a shorter-range, faster-charging lithium-titanate oxide battery. 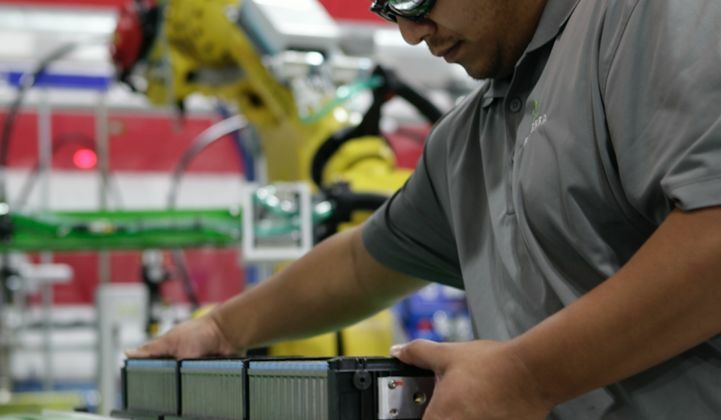 Proterra and LG Chem's battery cells are made in a facility in Burlingame, California, and have been developed to have a longer life, higher performance and safer use than other competitive lithium-ion batteries, say the companies. The Proterra/LG Chem battery has an energy density (amount of energy stored per volume) of 160 watt-hours per kilogram. Horton says that improved features are a result of better packaging of the lithium-ion battery, not necessarily the chemistry. But eking out range for city customers was important. “We wanted to make sure that we could meet the needs of every transit agency in America,” said Horton. City buses can often run 40,000 miles a year for 12 years. That’s one of the reasons Proterra, a venture-capital-backed company, has seen some success. This summer, Proterra announced a big investment round of $55 million from BMW’s venture fund, BMW iVentures, and Generation Investment Management, a fund partly managed by Al Gore. To date, Proterra has raised $195 million, making it one of the more well-funded cleantech startups. Other investors include Kleiner Perkins, the venture fund of General Motors, GM Ventures, family office Tao Capital Partners (of the Pritzkers), Japanese giant Mitsui, and others. Proterra isn’t the only company making electric buses. Chinese battery and vehicle maker BYD, which is backed by Warren Buffett, has made electric buses, many for the Chinese market, for years. Tesla’s CEO Elon Musk has even talked about Tesla making an electric (and automated) bus one day. As for Tesla’s semi truck unveiling, Horton says it’s bringing in more interest and attention from the trucking market to electrification. “You now see a lot of OEMs trying to figure out what their electric strategy is,” said Horton. But Proterra doesn't plan to compete in the electric long-haul truck market. It has the world’s buses to electrify. Listen to our earlier interview on The Energy Gang with Proterra CEO Ryan Popple about the company's origin and technology roadmap.